In 1964, italian artists Alberto Grifi and Gianfranco Baruchello gave birth to one of the most interesting and significant experiments in the fields of art and cinema: “Uncertain Verification”, a paradoxical assemblage of cinematographic extracts taken from over 450.000 feet of Hollywood footage from the 50s, originally destined to be destroyed and purchased for the price of 15.000 lira. Over forty years later, the imaginary art-group Les Liens Invisibles are reinterpreting and re-actualizing Grifi’s and Baruchello’s deconstructive action in order to complete the originally planned conceptual dissolution, picking up where the two artists left off, at the unfinished phase of dispersion, the Disperse Exclamatory phase. This operation of reverse engineering at the base of the project by Les Liens Invisibles consists in deconstructing the footage image by image, and publishing a fragmentary version online, making the “source” contents of the cinematographic work accessible to the public. Through this process, its rigid, logical and linear narrative structure can be interpreted in an “Open Source” type of approach. 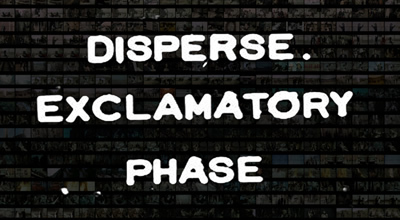 “Verifica Incerta” thus becomes “Disperse Exclamatory Phase”, an anonymous sequence of 1075 digital fragments, ready to be (im)possibly repossessed and recombined by that part of the network working in favour of a new narrative, dispersive, rhizomatic and potentially collective.